We were walking away from the Kotel after davening Yom Kippur and Succot mornings and the market street in the Old City was lined with angry arabs screaming, "Allah akbar! Allah akbar!" The women's voices were particularly harsh. It was an ugly scene. Some held signs "End the Occupation!" Thank G-d, the Israeli soldiers and police were there to prevent them from attaching us. When I read the signs, "End the Occupation" I had to agree. Both the Torah and the Koran state clearly and many times that this land has been given to the Children of Yaakov (the Jews), and it is time for all of the uninvited arabs to leave. 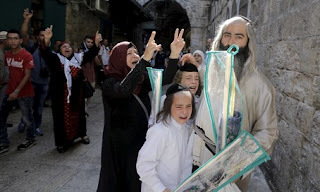 They are illegally occupying the Jewish Home Land and are the cause of all of the unrest in the Land today. Uninvited arabs, end the occupation. Leave our land now! And Y'all expect "Peace and Secutiry"? How 'Bout being brave and Dismantling those @bominations? It makes me really sad when you quote the Torah, Hashem's holy book and the blueprint of the universe, with a book written by a disgusting criminal. The Torah needs no external proof to support its truth. Mentioning the Torah with any other book doesn't add anything whatsoever to its veracity, quite the opposite. As for the incident with the Arab women, at law what they did constituted harassment and an attack. B"D it didn't result in physical harm, but it was a criminal offence.